Jomalou is owned by Tim Bowles who cruises in company with his partner Jane. Tim lives in Lincoln’s Inn in London. Jomalou is currently lying in Thames Ditton Marina. 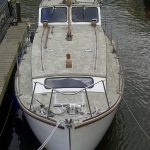 She was built in 1972 by the Rampart Boatbuilding Company, designed by John Desty with Hull number 713. She is a Rampart 32, length 31′ 7″ displacement 6 tons. 4 berth with twin Perkins 4107 48 horse power diesels. Like many boats of her age she has a chequered history, including a forced sale and being abandoned in the mud at Yarmouth IOW, by reason of a matrimonial dispute. Since then she has, in previous ownerships, cruised from Plymouth to the Medway and up the Thames to Oxford., has twice crossed the channel, cruised up the Seine and Yonne to the canal du Bourgogne, cruised up the Marne and into the Saone and wintered for two seasons at St Jean de Losne. This, our first season with her, we have been learning her ways, but the hope is that, when work permits, we will continue her previous cruising profile.